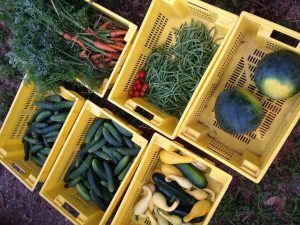 Nothing could be more local –or make you more of a locavore – than eating locally grown produce that comes from your own garden plot. You may be thinking that you don’t have room for a garden, but I assure you that the vegetable garden has become “sweet ‘n’ neat” over the past few years for a couple of reasons. The first is thanks to some new varieties of tomatoes by that very name. ‘Sweet ‘n’ Neat Scarlet,’ ‘Sweet ‘n’ Neat Cherry,’ ‘Sweet ‘n’ Neat Yellow’ and the equally impressive ‘Little Sun Yellow’ have taken the new urban vegetable garden by storm. But the garden itself might also be considered “sweet ‘n’ neat,” as more urban dwellers are getting into the hottest trend in the country, which is growing produce. Just a few years ago it was estimated that 54 percent of those who garden actually grew vegetables. Whether it is in rural areas, historic districts or the newest neighborhood, the size of garden plots have gotten smaller. Even the well-known community garden projects display raised beds or boxes that are a far cry from the farm-type plot of our grandparents’ era. This small garden concept is not just here, but in Europe as well, which has led to a host of new, compact vegetables. Tomatoes are, of course, first when it comes to popularity with those wanting to grow edibles. While determinate varieties – those we recommend that you cage – fit a smaller garden situation, new patio varieties open the door even wider, enticing everyone to grow some even if it is in a container. In addition to these tomatoes, there are also great selections suitable for growing in baskets, like ‘Tumbling Tom Red’ and ‘Tumbling Tom Yellow.’ In university trials, in which I was a participant, we harvested 4.5 pounds in one picking of ‘Tumbling Tom Yellow’ tomatoes. This caused even those connected to commercial production to take notice. At other trials I counted 40 cherry-sized tomatoes ready for harvest on a ‘Sweet N’ Neat Scarlet’ being grown in a small, 6-inch container. Tomatoes aren’t the only varieties going compact. There are choices in both sweet and hot peppers, zucchini squash, acorn squash, eggplant, okra, pumpkins, basil, strawberries and more. Whether it is the global economy or food health scares that has fueled this trend, there are some great family benefits from these small, urban gardens. Today’s children are growing up in a fast-food world where nutrition and lack of outdoor time is common. Once a child participates in growing vegetables, he or she will also want to partake in the eating of their crop. Consequently, this child becomes the gardener of the future. So whether you are a parent or a grandparent, get them started. Since today’s urban vegetable garden is smaller, getting the soil rich and fertile is a proverbial “piece of cake.” Organic products are available at most garden centers by the bag or even by the scoop. The garden is constructed on raised beds and enclosed or separated from lawn areas with wood or rocks. This not only gives you the best in drainage and aeration, but keeps the encroaching grass out. You can simply use the string trimmer around it. This style of garden makes it easy to tend from all sides without compacting soil by constantly making trips to hoe or weed. It can even be harvested by simply reaching inside. Where do you start? Just grow what you like to eat! Posted in Featured, Resources. Bookmark the permalink.